I was in Paris in the beginning of December and so I had the chance to see the latest show by Vincent Delerm. 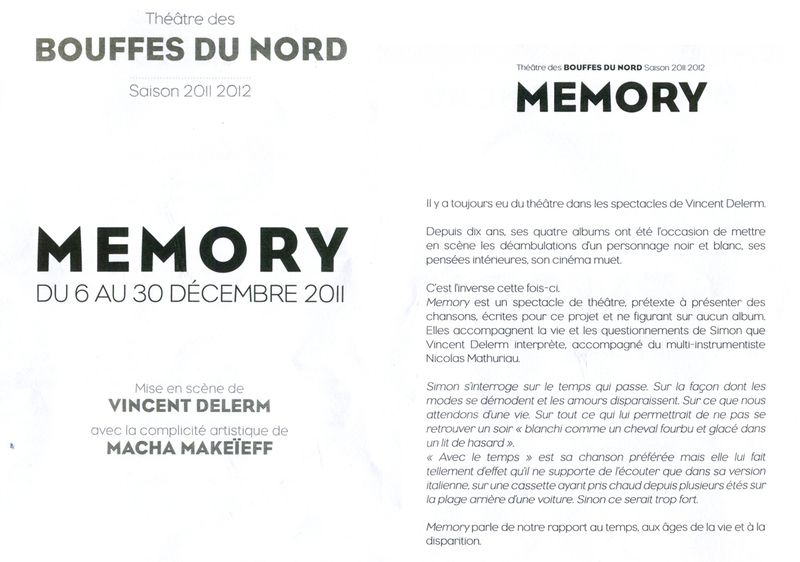 It was the first time I’ve ever seen Vincent Delerm live, so I was a little anxious, specially because in this case Memory wasn’t a regular music concert, but more of a theater play that features music. The show was held in a very cute Parisian venue called Les Bouffes du Nord, an amphitheater that reminds us of Shakespearean times. Not too big like any amphitheater, the place is a great choice because of its perfect cozy atmosphere. The round shape seems to bring people together and, later that night, I realized that this is exactly what Delerm wanted. The play opens with a recording of Woody Allen presenting a character surrounded by a cloud of nostalgia. Probably, the choice of Woody Allen has much to do with the fact that the subject of the play – nostalgia – is exactly the subject of the director’s last film (Midnight in Paris), and if we think about it, it’s the subject that pretty much defines Allen’s work. Throughout the show, Vincent, playing the character Simon sings 8 new songs and, among them at least 5 were very good, better than those from we the singer’s last album – 15 chansons. Besides singing, he dances, talks, plays tennis, juggles balls with fluorine and even rides the bicycle on stage, always accompanied by multi-instrumentalist Nicolas Mathuriau. The latter, a sort of Sancho Panza’s has a super important role in the presentation acting as a musician (he plays the harpsichord, keyboard, drums and xylophone) and supporting almost all of the funny skits written by Delerm. Vincent talks about life, about love, about France and the day-to-day life. The show is sweet, touching and funny, and although I’m not such a big fan of the Theater, I left there with a smile on my face. And not because Delerm is one of my favorites of the chanson française, but because he delivers a truly honest show, welcoming the audience into his world in an openhearted manner. The show will be on until December 30th at Les Bouffes du Nord (click the link to get tickets) and I strongly recommend it!